Our goals include the rescue, rehabilitation and placement of abandoned rabbits, plus public education regarding proper rabbit care and the importance of spay/neuter in battling the escalating overpopulation problem. We average a minimum of 15 to 20 calls and emails per day...most of them from people looking for someone to take their rabbit(s). Although we can't take in every rabbit, we answer each and every call/email, offering information on care, feeding, health/behavior, littertraining, or how to re-home a rabbit safely. These double and sometimes triple in the months following Easter, but each and every one is returned. We also provide Matchmaking services for those with single lonely buns searching for that "special somebunny". (See our Matchmaking page for details.) 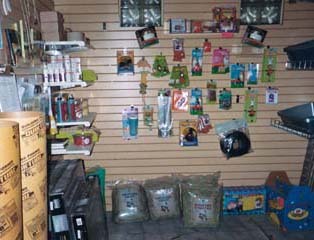 We rely on public donations and monies made by our on-line store rabbitshop.com to stay operational. 100% of ALL monies earned go directly to our bunnies to pay for hay, pellets, fresh greens, housing, spay/neuter, utilities, advertising, event supplies, office supplies, veterinary care, drugs & medical supplies, toys and other needed environmental enrichments. Most of our rabbits come from local shelters where they're slated for euthanasia. All of our rabbits come from very unfortunate circumstances ranging from simple neglect or abandonment to outright abuse. They require both emotional and physical rehabilitation, and we keep our number of rabbits low to ensure each of them the optimum in medical care and individual attention. Quality over quantity. The end result is a happy, healthy bunny... litterbox trained, socialized, and ready to be a loved and loving member of your family. 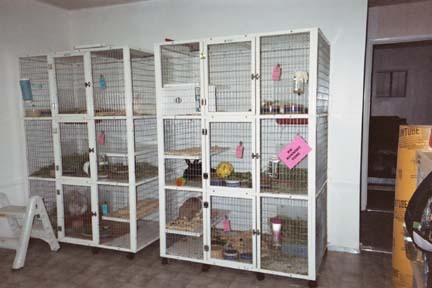 These cages are a roomy 52 inches long, 30 inches deep, and 22 inches high with an adjustable shelf for jumping or roosting. 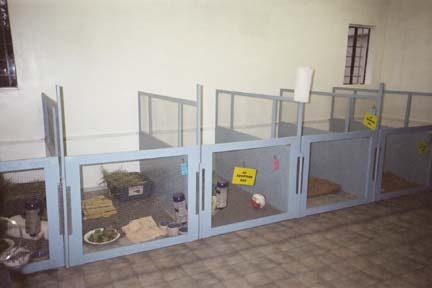 The shelf is removable and the litterbox recessed for the bunnies' post-surgical safety and comfort. The buns at Rabbit Rescue recieve daily attention and supervised outdoor playtime in the grass and fresh air. Their everyday routine - 365 days a year, with special feasts on holidays - includes fresh veggies, pellets, hay, water, and lots of TLC. Great hand-made pens...5 and 1/2 feet long and just over a yard across. Good air-flow and lots of room for toys, tubes, and mats to keep bunny healthy and happy. 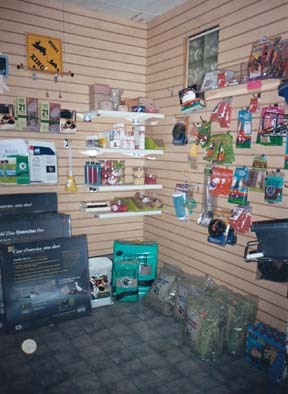 Our "One Stop Shop" at the Adoption Center...everything you need to get your bun off to a great start in his new home. Litterboxes, bowls, bottles, dishes, exercise pens, hideyhouses, toys, treats, meds, hay, pellets, brushes, harnesses, books, play tubes - and more!